Playdoh is one of those toys that I had sort of forgotten about. It was in Bosnia but very expensive so we never bought it. Cream of Tartar (needed to make the home made variety) was not around, at least in a packaging that I could understand. 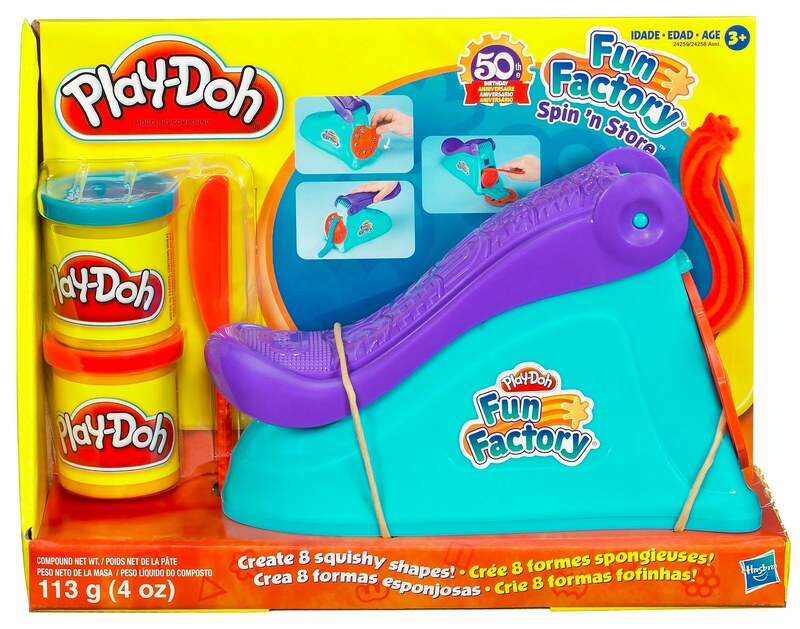 So when I was offered the chance to review the Play-Doh Fun Factory Spin n' Store I jumped at the chance. My first impressions were that it wasn't as big as I was expecting. With the name Fun Factory, I assumed that there would be all sorts of sections and bits (all of which would break) and sort of take over the table and the tiny amount of storage space we actually have. Actually it is fairly small: there is basically room to squeeze some play-doh through different shaped holes to make different shaped play-doh worms and a couple if different designs to squidge your play-doh onto. It comes complete with plastic knife (crucial for scraping bits of play-doh off of tables, hair, stuff) and, joy of joys, has the space to store all its bits. I gave it to the 3 1/2 year old first. He played with it for a little while, squidging worms etc. before casting it aside. But, later in the day he came back to it. And then he came back to it again, and again and again. In my books this makes for a Good Toy. He really enjoys it. The 5 year old also had a go. It hasn't captured his imagination as much, but he has just discovered Lego and is currently obsessed with building space ships so I wasn't surprised. That said, he has also come back to have a play a few times and does enjoy himself when he does. My opinion? Well, they provided 2 different coloured packets of play-doh which I try in vain to keep separate. I've learnt the hard way not to let them play with it near carpets. But I like the compactness of it, I like that all the bits can be stored within it and I like that they have wanted to play with it over and over again. And for £4.99 you can't ask more than that.